Home » Crohn's Disease • My Thoughts • Science » Low-FODMAP and Paleo Autoimmune Protocol: What Can I Eat? Low-FODMAP and Paleo Autoimmune Protocol: What Can I Eat? Do not fall into the trap of restricting more and more foods in search of healing. You should not need to avoid high FODMAP foods forever. If you find that you can not reintroduce them in at least moderate quantities, I strongly recommend you seek the assistance of a medical care provider to help you do some troubleshooting. We spent a glorious day last weekend picking apples. I ate my share in the orchard, sampling as I picked to make sure I liked each variety. Then we came home and I made applesauce, sampling some more. Then I made a grain free apple tart for company we had coming the next day and sampled that too. And then I paid for it. Truth be told, my stomach was hurting already after just a couple big samples at the orchard but the apples were just so alluring that I failed to listen to the signals that I was overdoing it. I ended up with cramps, gas, and a few extra visits to the restroom. One day wouldn’t have been too bad, but then it stretched into the next day, and then the third day. Only now, on day four, do I feel myself coming back to the happy baseline I had achieved through strict adherence to the paleo autoimmune protocol. But apples are paleo, right? And they aren’t nightshades or nuts or seeds, or anything else generally restricted on the autoimmune protocol. So what gives? 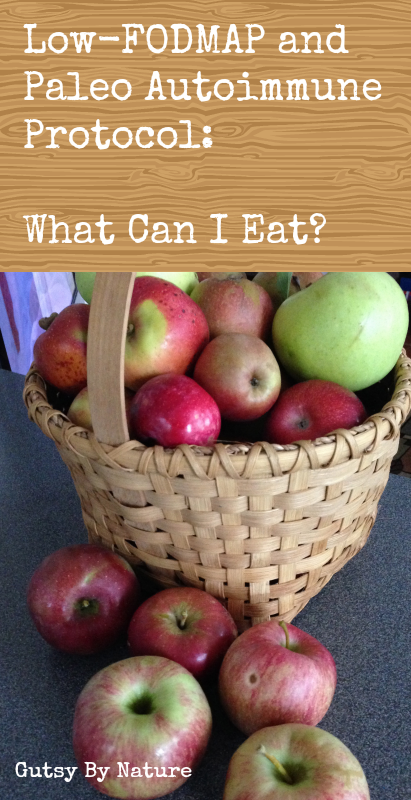 The answer: Apples contain high amounts of fructose and polyols, both of which are FODMAPs. If you have Crohn’s disease, ulcerative colitis, irritable bowel syndrome (IBS) or another digestive disorder or issue, you may have heard the acronym FODMAP which refers to certain foods that can cause and exacerbate bowel symptoms in people who are sensitive to them. A low-FODMAP diet eliminates or minimizes these foods and can be particularly effective to promote healing and minimize symptoms while the autoimmune component of the disease is being brought under control by following a paleo autoimmune protocol (AIP). This strange term stands for this tongue twister: Fermentable Oligosaccharides, Disaccharides, Monosaccharides and Polyols (you can see why they came up with an acronym!). These are carbohydrates that are not absorbed in the small intestine and may pass into the large intestine where bacteria ferment them, resulting in bloating and gas. This occurs in many individuals and does not cause significant issues for them, but for others it results in symptoms of IBS including abdominal pain, nausea, diarrhea and/or constipation, flatulence and other gastrointestinal symptoms. It is not exactly clear why FODMAPs bother some people with the inflammatory bowel diseases (IBD), but pilot studies have shown that following a low-FODMAP diet does help reduce symptoms in people with active Crohn’s disease. The low-FODMAP diet was developed at Monash University in Melbourne, Australia in the late 1990s and early 2000s. Many of the foods that contain high levels of FODMAPs are otherwise quite healthy and would ordinarily be a staple part of a paleo diet. The good news is that FODMAP sensitivity is dose dependent so most people are able to eat FODMAP foods as long as they keep the amount in check and many people are able to eat some or all of the FODMAP foods when their disease is not active, returning only to FODMAP elimination when and if symptoms begin to return. Personally, since going paleo and getting my disease mostly under control, I can eat high FODMAP foods as long as I don’t over-do them and am otherwise feeling good. If I do overdo it with one FODMAP food (like the apples) then I start to become sensitive to others that I normally tolerate just fine (like onions and sweet potatoes). To reset my system and get back to feeling good I have to cut back on all the FODMAP foods for a couple days. 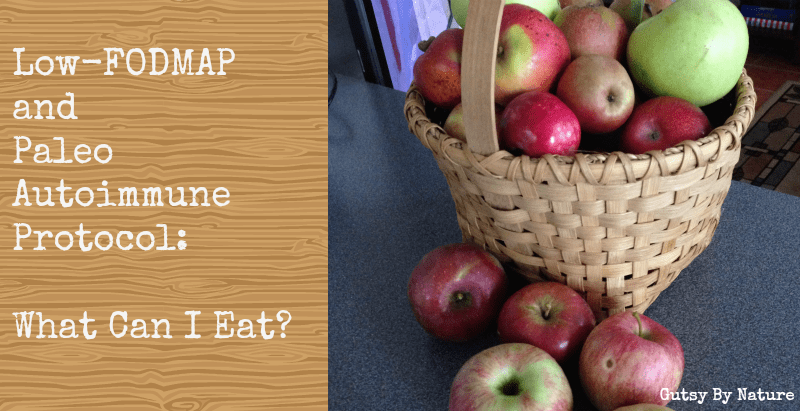 So what can I eat if I’m on AIP and eating low-FODMAP? Being on both a low-FODMAP and paleo autoimmune protocol diet can seem extremely limiting. A wide range of foods contain high levels of the various FODMAPS and unfortunately, not every source agrees on exactly what they are. A nice starting point is the Monash University list (they also have an iPhone app with even more detail). The list can be overwhelming, especially when you are also eliminating so many other foods. 1. Continue the AIP protocol. Continue eating a clean paleo diet and continue avoiding foods that are autoimmune triggers for you. This may include all nightshades (tomatoes, potatoes, eggplant, and peppers), dairy, nuts, seeds, eggs, chocolate, and alcohol. If you have successfully reintroduced any AIP foods, you may choose to avoid them while you are letting your digestive system reset, or you might decide to continue eating them. So far I have reintroduced eggs, potatoes, and small amounts of dark chocolate and I decided to keep eating them after my recent overindulgence in apples, but perhaps I would have bounced back to normal more quickly if I did eliminate them. I don’t plan on there being a next time, but if there is I will probably try cutting those foods back out also. 2. Embrace your inner carnivore. All meat is allowed, both on AIP and the low-FODMAP diet. Plus, when the body has been stressed and is reacting negatively, it needs the nourishing proteins and fats more than ever. To get myself back to normal I load up on well cooked, easy to digest meat and drink lots of bone broth throughout the day. 3. Eat plenty of safe vegetables. 4. Let fruit be your treats, but keep it to a minimum. Be mindful of your own personal tolerance level for fruits. In larger quantities, even the low-FODMAP fruits can end up providing a dose of fructose that is bigger than many people can handle and also contributes to inflammation. Also, many people with autoimmune diseases are very sensitive to blood sugar changes and need to limit their consumption to eating fruit only with meals in order to avoid spikes. Early FODMAP testing showed that coconut was high in sorbitol but more recent testing has shown this not to the case and Monash University now lists it as low-FODMAP. However, some people do not tolerate it well regardless so be cautious. Personally, I have found that coconut products of all types work very well with my body, even when my digestion is iffy, so I load up on it as a good source of healthy fats. My friend Christina of A Clean Plate has a great e-book called 28 Days of Low-FODMAP AIP that is a great jump start for anyone beginning AIP and also eliminating high FODMAP foods. It includes recipes as well as meal plans and shopping lists and is bargain priced at just $9.99! Also, the recipes in these cookbooks indicate FODMAP status and provide modifications whenever possible. I cook from all frequently and highly recommend them! I, too, have had trouble eating apples. I can not eat tons of garlic or onions because of FODMAPS, but I never experienced pain like I did when I ate a couple of apples (skin on). I suspect it was the fiber. I’m re-doing the elimination diet, and this time I’m using AIP as a guideline. Thanks for your recipes and resources! WOW! A site dedicated to AIP & Low fODMAP! I am so excited and relieved. Its difficult to weed through it all alone. Often it is more than one issue going on in the gut that need to be addressed and eliminated. Thank you for putting in the time and energy! Then I can consume more? I eat about 1/4 cup to half a cup of fermented vegetables per day and they are the ones listed, unfortunately. Please let me know?? Thanks. Thanks for this great post on AIP and Low Fodmap! I have started my journey a few days ago but have been paleo for a while. I was just wondering one thing since there seems to be a lot of conflicting information on the interweb. Is pumpkin really low fodmap as per your post or just certain types? I read multiple times that butternut is very high in fodmap and I think other pumpin varieties haven’t been tested yet. I am really craving some pumpkin but don’t want to mess up ;). There is a lot of conflicting information out there! What makes it even more confusing is that the leading research institution is in Australia where what they call “pumpkin” is not the same as what we call “pumpkin” in the United States. However, last year around this time they published this blog update – http://fodmapmonash.blogspot.com/2014/10/newly-tested-food-for-fodmap-content-we.html – which seems to give the green light to canned pumpkin as we know it, at least if you keep your serving size down to 1/4 cup. In regards to butternut squash, everything I have seen says it is low-FODMAP. See this list – http://www.ibsdiets.org/fodmap-diet/fodmap-food-list/. All pumpkins are winter squashes. There are, however, 3 different species of winter squashes. C. pepo contains nearly all summer squashes (which includes zucchini), and some winter squashes like orange pumpkins, acorn, delicata, and spaghetti. C. maxima contains most winter squashes, like buttercup, hubbard, kabocha, turban, and queensland blue. C. moschata contains butternut squash, trombochino, and calabaza. I’m so glad I found your site. Most of the sites have too much sugar and other non-AIP ingredients. This site is such an inspiration! I love all of your recipes, not only do they taste great but they agree with my stomach! Your work is deeply appreciated. Thank you for so much info! I have SIBO and as I prep for being on a low fodmap/no to low carb die, the more confusing it all is. This list my naturopath gave me says okra and plantain chips are not low. ugh its so tough because you want to do whats best for your body! I have the Monash App which is kept up-to-date with the most recently tested items in terms of FODMAPS. According to the most recent update plantains have not been tested but are presumed okay esp when green because of bananas being okay. Okra is low FODMAP up to 6 pods. Over 10 and it becomes moderate. Thank you! I tend to agree with this list. I’ve done the whole30 but struggled with the huge meals to get to the next meal. I prefer smaller meals throughout the day. Does anyone else find that too? Can someone give me information on fermented foods like Kombucha? Okra is a nightshade vegetable – so not AIP. I hope you’ll revise the list. Okra is not a nightshade. The food lists that include it as such are wrong.